Ah yes, the weekend at Bear Lake, Utah for my wife's family reunion, part two. I actually intended on posting this second part yesterday, but my computer was confounded with some oddity where it thought the arrow key was stuck. I'm sure it was a driver issue somewhere because it persisted even after unplugging the keyboard and mouse. I have since performed a reload and I'm back up and running, for the most part. Anyway, back to Bear Lake! After dinner we all make sure we've got a good spray of misquito repellant and get ready for the camp fire. 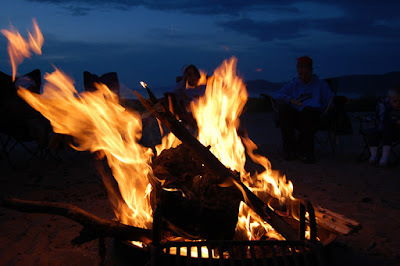 Everyone sits in camp chairs around the flame and stories are shared. A lot of them gravitate back to Bear Lake from years before. It's always interesting to sit back and enjoy the fire and the conversations. Once the wood has burned down to a nice layer of coals, the marshmellows are brought out. Some toast them and eat them plain, some prefer to make smores. This year my wife brought up toasted coconut flavored marshmellows, they were quite a treat. On the second day, our wee one had her very first birthday. As is tradition in our family, ever since our first wee one, she got her very own smash cake. Since we were camping, it was technically a smash cobbler (with raspberry filling!). She loved it! To keep track of our two older children, we equipped them with walkie talkies. This allowed them to venture a little further than in previous years, but we always had an idea of where they were. In fact, they loved them so much, they would talk to us on them constantly. Hey, parents need attention too! All in all, I had a great time. The headache was a bit of a downer, but it was a nice break. My wife did a wonderful job of setting up the tent and preparing our meal while I watched the kids. It was a nice reprieve from my 14-16 hour days of work for the last month or so. She appreciated a bit of a break from the kids as well so it worked out to be a really nice trade-off, even if it did raise a few eyebrows from her extended family. You had such a wonderful respite from work. Being with your family are always the best times. We often have bonfires too when I was a kid, and they always bring back poignant memories.